Herbs and Spices gift sets really are the perfect present for any enthusiastic cook. From the culinary beginner to the accomplished chef, there is a spice gift set tailor-made for that person, guaranteed to induce excitement and adventure in the kitchen! 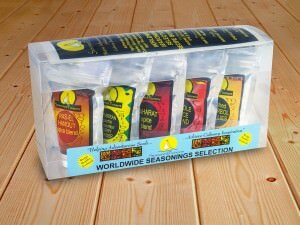 The very finest quality herbs, spices, seasonings and spice blends have been thoughtfully chosen by the team at Seasoned Pioneers to create gift sets to satisfy every taste. 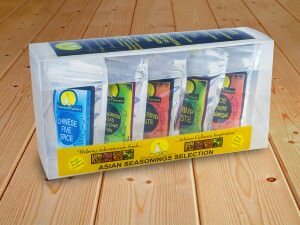 Among the gift sets available are selections of particular types of spices such as chillies or peppercorns, as are herb gift sets, which include a spice or two, designed to complement the herbs within the set. Others are collections to prepare regional cuisines, selections to complement cookery books and some are even designed for cooking on your holidays! 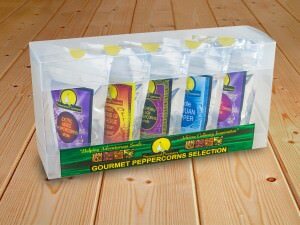 We are confident that within the Herbs and Spices Gift Sets that we offer, you will find at least one that is exactly what you are looking for. It’s not always easy to think of a unique and innovative gift, so we hope that we can help solve those present predicaments at any time of the year! 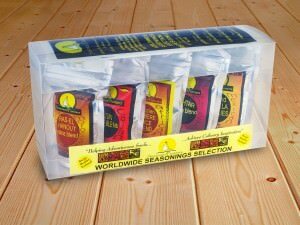 This spice gift set literally takes the adventurous chef on a worldwide journey from South America to the Middle East via Louisiana and North Africa! 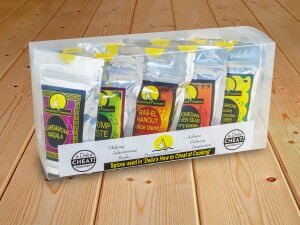 Contains our legendary Ras-el-Hanout, Mexican Pasilla chillies, Zahtar (Za’atar), African Berbere and Cajun spice blend. 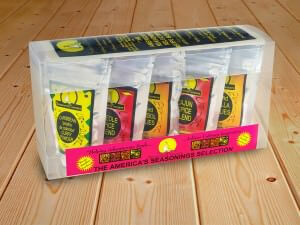 North and South American spices are represented in this gift set. When creating Mexican cuisine, it is essential to use authentic Mexican chillies, which is why the set includes explosive de Arbol chillies and the more sultry Pasilla chillies. We’ve also included the delicious Caribbean Poudre de Colombo spice blend and to whisk you off to the swamplands of Louisiana, our Cajun and Creole spice blends. For the wok enthusiast, no truly southeast Asian dishes can be created without the staple ingredients of Thai Kapee Shrimp paste, Tamarind paste, Lemongrass and Laos powder (ground Galangal). Add to this our authentic Chinese Five Spice and authentic Asian cuisine is there for the eating! 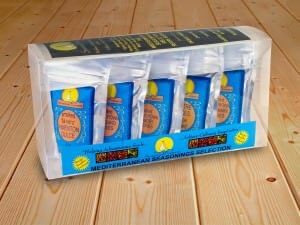 This popular set is a must for all those chilli-heads out there, brave or daft, you can decide! 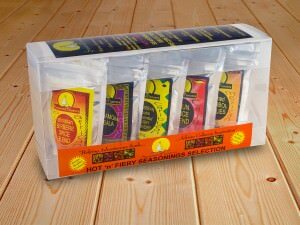 Ranging in heat from the sultry to the volcanic, this set contains Pasilla, Chipotle, Birdseye, Piri-Piri and de Arbol chillies. These ten Seasoned Pioneers spice blends and pastes are listed as ingredients in some of the recipes within Delia’s best-selling book. Essential to the preparation of those recipes are Poudre de Colombo, Goan Xacuti curry powder, Ras-el-Hanout, Cardamom Masala, Indonesian Seven Seas, Tsire powder, Sambhar powder, Tandoori Masala, Tamarind paste and Shrimp paste. The ultimate spice gift set for those who love to bake! In 2013 Delia re-launched her sensational book ‘Delia’s Cakes’, first published in 1977. These spices feature in 29 of the recipes in the book: Mixed spice, Ground Cloves and Fairtrade Organic Ginger, Nutmeg and Cinnamon. 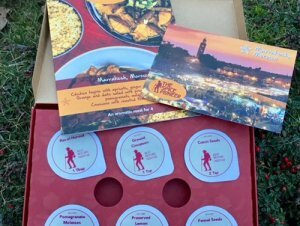 Including a recipe and usage ideas booklet, this set is an exotic array for adventurous cooks, with Moroccan Ras-el-Hanout, Caribbean Poudre de Colombo, Creole spice blend, Middle Eastern Baharat spices and Mexican de Arbol chillies. Do you know someone with a passion for pepper? Jazz up their peppermill with this gorgeous collection of Exotic Mixed Peppercorns, Pink Peppercorns, Grains of Paradise, Sichuan Pepper and the finest Indian Tellicherry black peppercorns. Just what is says on the box, a heat-lovers medley of spiciness! Crushed de Arbol chillies, Berbere spice blend, Cardamom Masala, Poudre de Colombo and Cajun spices. They’re hot! Everyone loves to cook or eat a curry and there’s nothing better than the aroma of curries on the stove. 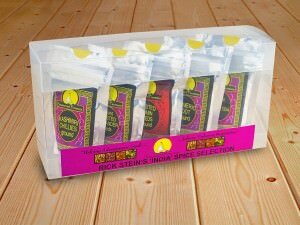 Create a traditional Indian banquet using our Balti Garam Masala, Sri Lankan curry spices, Cardamom Masala, Ajowan seeds and Pilau Rice spices. This herb gift set, with a couple of spices thrown in, will remind the recipient of the rocky coves of the Mediterranean coast, the scent of pine trees and picturesque olive groves. Wild-grown Oregano, Savory and Rosemary, complemented by smoked Pimenton Dulce and Quatre-épices. Love entertaining? This set is sure to help the perfect host impress their guests! 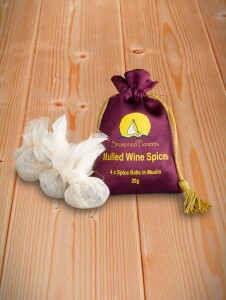 On winter nights, welcome friends and family with a Hot Toddy or a glass of spiced Mulled Wine. Serve chilled Caribbean Sorrel Rum at a summer get-together and Mulled Cider when the sun goes down on your barbecue. The ultimate ending to a fabulous dinner party is surely a cup of Cajun spiced Café Brulot? The organic cook will love using this array of worldwide flavours. 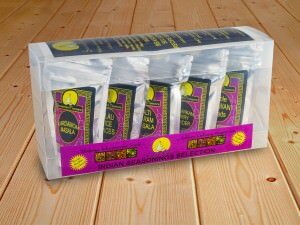 All Soil Association certified, it contains organic Balti Garam Masala and Baharat spice blends, organic Allspice berries, Clove buds and Savory leaves. 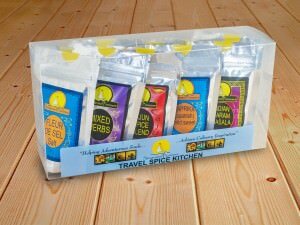 One of our top-selling herbs and spices gift sets, designed in conjunction with Rick Stein to complement his book, ‘India’. Included are five of the spices you need to create the perfect curry: roast and ground Coriander, Kashmiri chillies, roast and ground Cumin, Turmeric and Asafoetida. 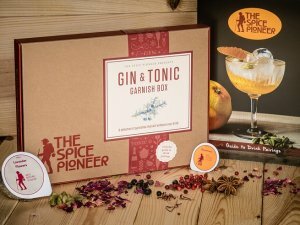 How about giving both the book and the spice gift set in return for a dinner invitation! Is it a herb gift set or a spice gift set? 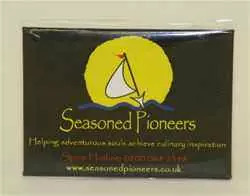 It’s both, carefully chosen by the team at Seasoned Pioneers, all of whom love cooking and eating in the great outdoors! 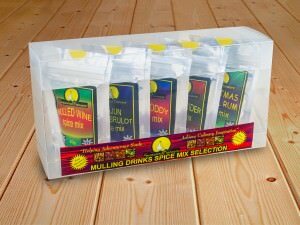 Whether camping, caravanning, self-catering or even as a starter set for newly-weds or students, this gift set has it all. With roasted Garlic powder, cracked black peppercorns, Fleur de Sel, Indian Garam Masala, mixed herbs, wild-grown Oregano, Chilli powder, Cajun spice blend, Chinese Five spice and sweet Spanish Paprika, there is no limit to the culinary repertoire on offer! All around the globe, curries feature in daily life. 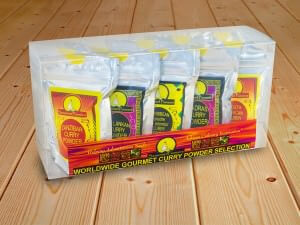 For any adventurous curry chef, this innovative range of curry spice mixes will bring them considerable pleasure – the authentic curry powders of Zanzibar, South Africa, West Indies, Madras, Sri Lanka and Malay, rounded off with Gujarati Masala, Indonesian Seven Seas spices, Mauritian Massale and Poudre de Colombo.